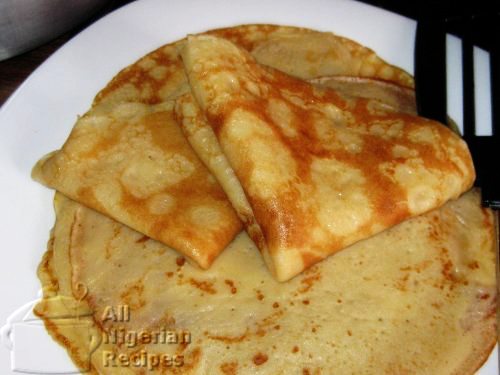 This is a simple recipe for the thin, delicious Nigerian-style pancakes. It is made with those ingredients that we always have in our kitchen. So you do not have any excuse for not making this recipe right away or latest this weekend. Most Nigerians think of pancake as just a snack. Yes, pancakes go well with a chilled drink. But have you ever thought of another way to enjoy pancake? Now listen to this! Pancake is the most balanced meal you can have at breakfast as it is a blend of protein (from the eggs), carbohydrates (from the flour) and fats and oil (from the butter and vegetable oil). And we are not even talking about the micro nutrients. Maybe that's why the pancake is commonly referred to as Diet in Nigeria. 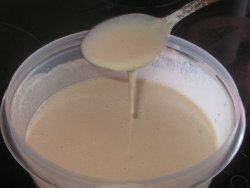 You can eat pancakes with Custard, Akamu (Ogi) or Oat Meal. So put more effort into your weekend breakfast by preparing this recipe for you and your family. Yes, mostly during weekends, so you can relax and enjoy the pancake because you are in no hurry to leave the house. Learn how to make the Nigerian pancake and re-live your teenage years when you used to buy Diet during recess or after school. Ring a bell? Want something similar? See the recipe for Sinasir, a Northern Nigerian (Hausa) rice delicacy. Put the margarine is a small bowl and melt in the microwave. You can also place the bowl in a bigger bowl of hot water to melt the margarine. Break the two eggs into the melted margarine and beat till smooth. Then add ½ cup of water. Add the flour and mix well till there are minimal lumps. Add the milk, salt, sugar, ground pepper and the remaining ½ cup of water, stir well. Blend the mix using a liquid blender. This will give the pancake batter the smoothest consistency. If you don't want to blend it, no problem, just mix the ingredients very well so that the lumps are minimal. Note: You can also add onions to the pancake but make sure that your blender can liquefy the onions. If not, the pieces of onions will not let you achieve very thin pancakes. Set a frying pan over medium heat. Add a few drops of vegetable oil. Just enough to lubricate the frying pan. When hot, pour some pancake batter into the frying pan. Tilt the pan so that the batter coats the surface of the pan evenly. This should be a very thin coat. Fry the underside of the pancake for approximately 1 minute, shaking the pan from time to time till the pancake comes loose. You can also loosen it with the spatula. Check the underside to be sure it has browned to your liking, preferably light brown. Flip the pancake so you can fry the top side as well. The pancake is done when both sides are light brown. 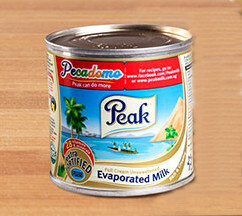 For breakfast, serve with Custard, Akamu (Ogi) or Oat Meal. If you just want to snack on the pancake, make sure you have a drink chilling in the freezer before you even start mixing the batter.